For more than 30 years Fred Rogers welcomed children and their parents into a realm of imagination on his show, “Mister Rogers’ Neighborhood.” Through his world of make-believe and real life experience, Rogers aimed to teach children self-esteem, how to understand their feelings and appreciate the world around them. 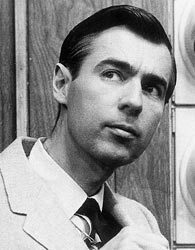 In 1968, after returning to Pittsburgh, Rogers’ show “Mister Rogers’ Neighborhood” was broadcast on the National Education Television network for the first time. The show used Rogers’ on-set neighbors and the puppets and characters in his Neighborhood of Make-Believe to help children understand their feelings, learn about the world around them, deal with difficult issues and learn that they are special, just the way they are. When the show ended in 2000, Rogers had filmed more than 1,000 episodes, and the show had won numerous Emmys and other prestigious awards. PBS Kids: Mister Rogers; Neighborhood: Remember When? After a battle with stomach cancer, Fred Rogers died on February 27, 2003, a few weeks before what would have been his 75th birthday. During his lifetime, Rogers received many awards and honors for his work in television, some of which include a Lifetime Achievement award from the Emmys, the title of “Living Legend” by the Library of Congress in 2000, a place in the Television Hall of Fame in 1999 and a star on the Hollywood Walk of Fame. His trademark sweater became part of the Smithsonian’s permanent collection in 1984. Prestigious Universities such as Yale have contributed to Rogers’ more than 40 honorary degrees. He composed more than 200 songs and wrote dozens of children’s books. Rogers was known as a man very true to his character on TV; he was soft spoken, kind and caring toward children. This article was originally written by Haley A. Lovett; it was updated February 1, 2017.